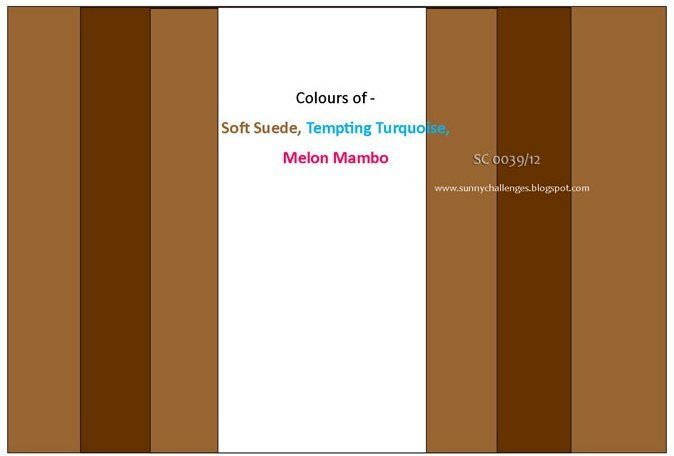 This week the challenge is to use the sketch plus the colours Melon Mambo, Soft Suede and Tempting Turquoise. Wow, this one really made me think and I had decided that I did not want to make a feminine card this week, but how do you make a masculine card with Melon Mambo? Well, I think I solved that problem, dont you? 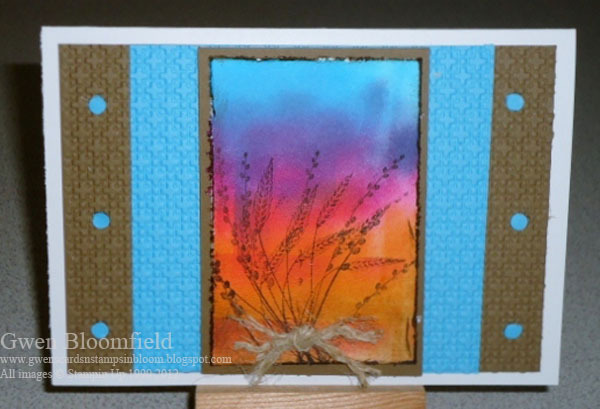 My card base is Whisper White and that was matted with Soft Suede and Tempting Turquoise. I then passed these through the Big Shot using the Lattice embossing folder. I used the colours Tempting Turquoise, Night of Navy, Melon Mambo and More Mustard, and sponged Soft Suede around the edges and also at the bottom of the picture. I used Early Espresso to stamp my image and a small piece of Hemp Twine tied in a knot and distressed to give it the appearance of a sheath of wheat that has been tied. The Tempting Turquoise dots were made by punching the holes with the Crop-a-dile and I attached these using the mini glue dots..This is what I came up with. I hope you like it, its a little different to what I usually do. Dont forget to head on over to Vicky and Kris’s blogs to check out their creations for this week, and we hope you play along with us at Sunny Challenges and Creations. More info on my blog if you would like it. Gwen, you have done a fantastic job with this challenge. The baby wipe technique on the image panel is gorgeous. I also love the crop-a-dile circles to embellish the side panels. Beautiful. Thank you Kris! I really want sure about the colours, but I do really really like it. Beautiful card Gwen! The image panel is just stunning! Thank you Sarah, I really wasnt sure about those colours but love the way it came together! Gorgeous Gwen. You have captured the colours perfect in your Baby Wipe & I love the twine around the wheat - perfect!!! Thank you Vicky! I think it turned out quite well for a masculine card.